It began with the sprayer hose. It was a silent, tiny drip that was only revealed when you grabbed the hose to rinse the toilet. The yellowed plastic had been worn down by 14 years of use. It wasn’t that big a deal; a quick wipe with a paper towel took care of it. But it was a harbinger of things to come. 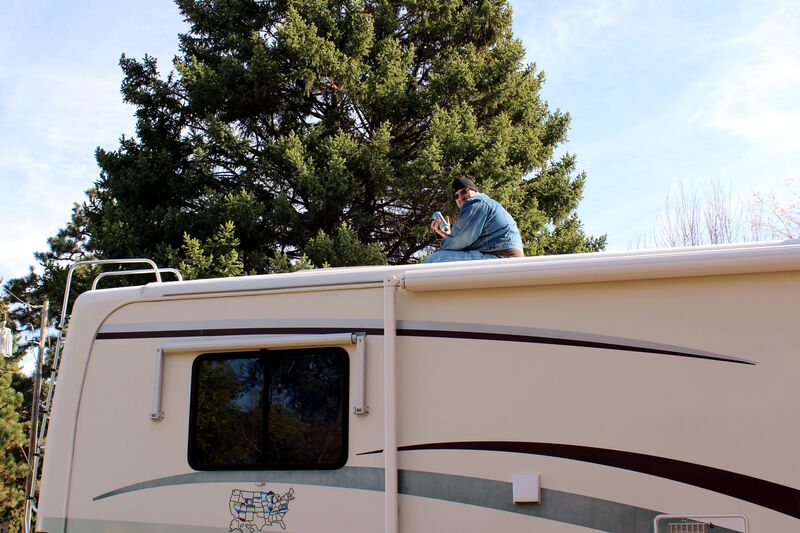 You can’t buy a 14-year-old motorhome – even a single-owner rig that’s got all its manuals and service records – and think it’s not going to have issues. The question then becomes what those issues are going to be. For us, it’s been water. Water has been the bane of our RV adventure since we started. We became accustomed to the drip from the sprayer hose, kept reminding ourselves that we needed to replace it, and then went on about our business. About two months into our journey, I was cleaning behind the toilet when I noticed what looked like a plant growing up through the tiles. It was black and spiky. Clearly, this was not good! Upon further investigation, Mike discovered that the hose was leaking from the other end, where it connected to the toilet. Apparently, the previous owner had tried to repair it; that repair had failed, and water had gotten under the tile. It was rotting the floor! We removed the nasty old toilet. Mike pulled up the tile and repaired the rotted portions of wood. We bleached. We sanitized. Mike caulked and spackled and sprayed Kilz everywhere. He installed a brand new toilet. He assured me that the floor was not going to collapse under me when we were rolling down the highway. Whew! One problem solved. Then, while scooping kibble into the bark babies’ bowl, I noticed the dog food bag was wet. I checked the shelf where I store it. It’s the bottom, carpeted shelf under the sink. It was sopping wet. Apparently, there’d been a leak from the sink plumbing. Not only was the shelf soaked, but it was covered with mold! Mike tightened up the fitting for the water pipe, which fixed it. We vacuumed up the mold. We heat dried the whole thing. Second problem solved. Then, in the midst of a deluge in Sioux Falls, the vent over our bed started dripping. We’d had this problem on occasion in the living room, and now our bedroom was compromised. Mike decided to wait til the rain let up to get on the roof and figure out what was going on. So, of course, it rained for days. 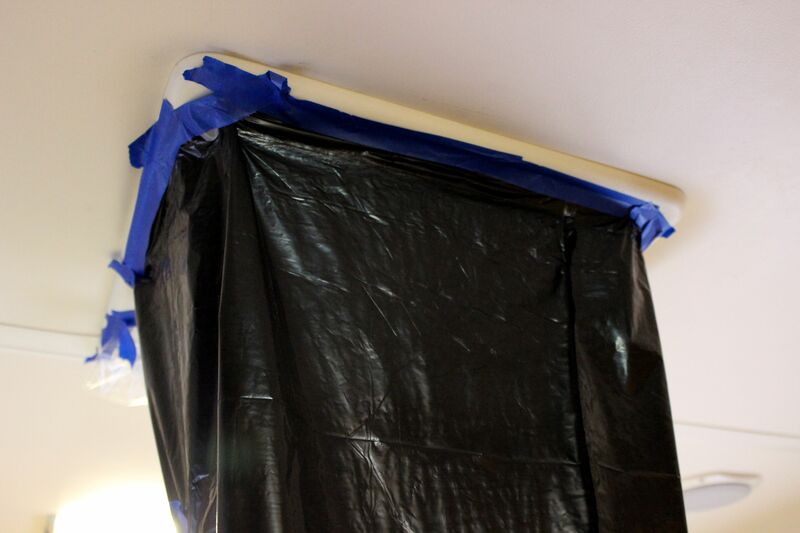 We improvised by taping a garbage bag around the vent and periodically emptying it. As soon as the weather cleared, Mike was up on the roof, filling the cracks in the covers of the heat/air conditioner pumps with silicone. So far, no more vent leaks. Third problem solved. Is the third time a charm? Or is this not the end of our water woes?? Yeah, you definitely don’t wanna’ be sitting on the toilet on a soft floor and end up in a basement storage compartment! Real bad juju. LOL!